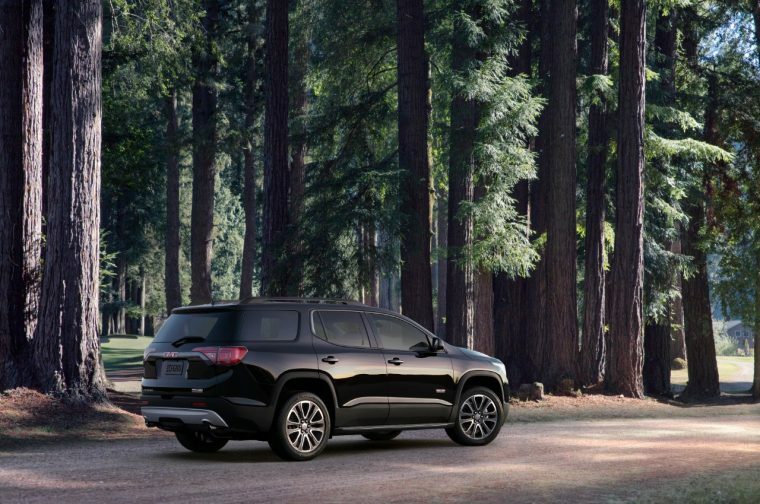 Dominating the road with its aggressive stance and classic GMC styling, the 2019 GMC Acadia is perfect for family road trips. It seats up to seven passengers with plenty of room for cargo, and comes with all of the latest infotainment options to keep you and your passengers entertained. The 2019 GMC Acadia is available in six trims: SL, SLE-1, SLE-2, SLT-1, SLT-2, and Denali. What’s New for the 2019 GMC Acadia? Sporting its strong and aggressive design, the GMC Acadia has a few new offerings for 2019. 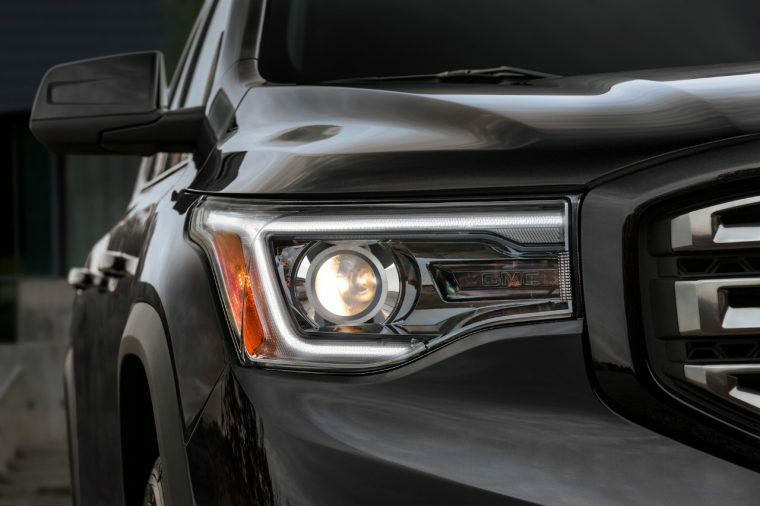 The 2019 Acadia offers an Acadia Black Edition. This special edition is available on the SLT and adds features with depth such as 20-inch machined aluminum wheels with black accents, black headlamp and taillamp details, a black grille insert and black surround, as well as other black exterior accents. The 2019 GMC Acadia also offers four new exterior colors this year: Dark Sky Metallic, Red Quartz Metallic, Pepperdust Metallic, and Smokey Quartz Metallic. 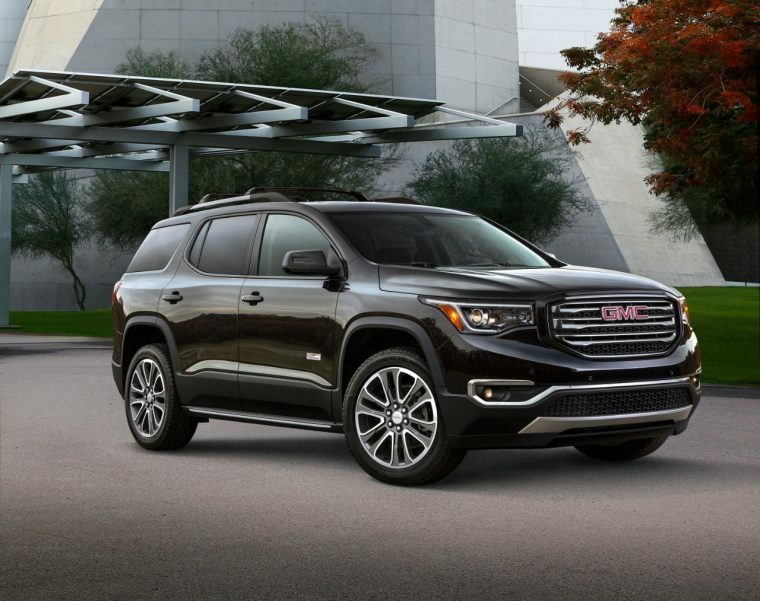 With a dark, aggressive stance, the 2019 GMC Acadia is a dominating force on the road. 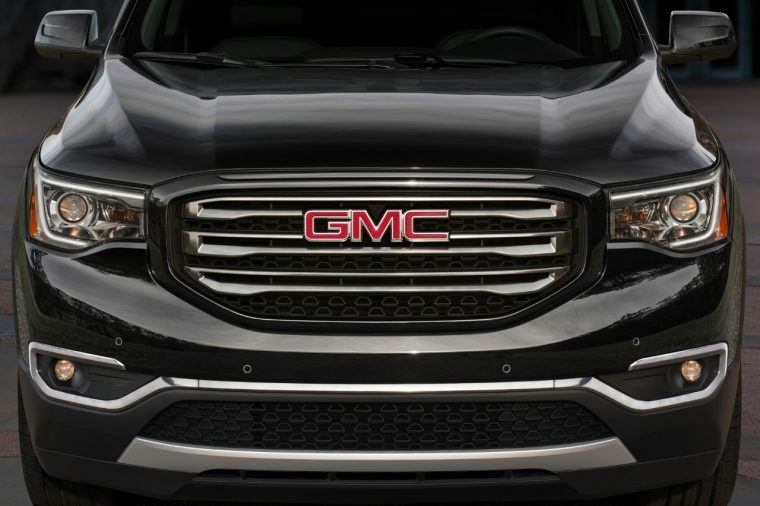 Its grille is distinct to the GMC brand, while its deep character lines and high wheel arches give it some extra grit. The GMC Acadia also comes with a variety of convenience features on its exterior, including heated, power outside mirrors and deep-tinted glass for added privacy. The 2019 GMC Acadia is available in 10 exterior colors: Dark Sky Metallic, Summit White, White Frost Tintcoat, Quicksilver Metallic, Pepperdust Metallic, Smokey Quartz Metallic, Iridium Metallic, Red Quartz Tintcoat, Blue Steel Metallic, and Ebony Twilight Metallic. Standard on the 2019 GMC Acadia is a 2.5-liter four-cylinder engine, equipped with Variable Valve Timing and a six-speed automatic transmission. As a unit, this powertrain gives off 193 horsepower and 188 lb-ft of torque. Beginning on the SLE-2, you can upgrade to a 3.6-liter V6 engine — also equipped with VVT and a six-speed automatic transmission. The V6 comes standard on the SLT-2 and Denali trims and gives off 310 horsepower and 271 lb-ft of torque. At its base, the 2019 Acadia earns an estimated 21 mpg in the city and 26 mpg on the highway when equipped with front-wheel drive. The stronger V6 loses a bit of its efficiency, earning an estimated 18 mpg in the city and 25 mpg on the highway when equipped with front-wheel drive. With seating for up to seven passengers, the 2019 Acadia makes it easy to accommodate the entire family. Tri-zone automatic climate control is standard from the base so everyone can be comfortable inside the cabin. 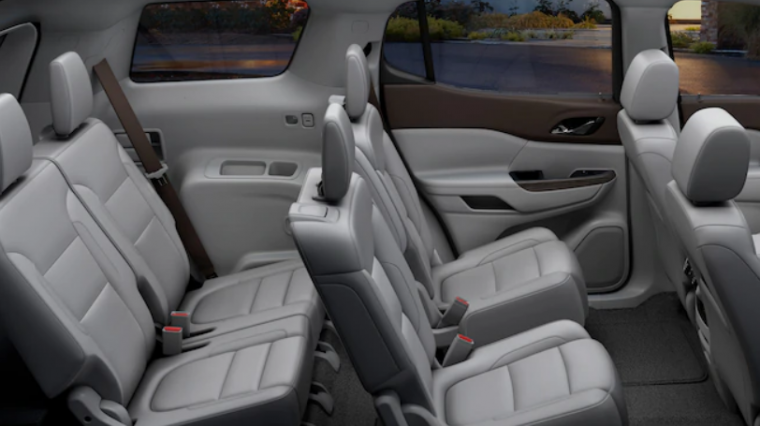 The GMC Acadia offers up to 79 cubic feet of cargo space thanks to adjustable seating arrangements. You can also enjoy advanced infotainment options like a built-in 4G LTE Wi-Fi hotspot and an eight-speaker Bose premium audio system on the SLE-2. 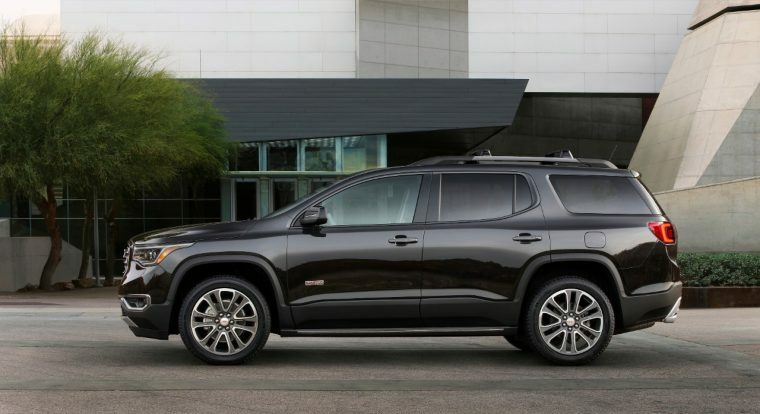 The 2019 GMC Acadia is available in two interior colors: Jet Black and Cocoa Light Ash Gray. In addition to its standard passive safety features, the GMC Acadia takes it up a notch with driver-assist options. You can opt for the Driver Alert Package I on the SLE-2, which comes with features like Lane Change Alert and Rear Park Assist. The SLT-2 offers the Driver Alert Package II, equipped with Forward Collision Alert, Low Speed Forward Automatic Braking, Following Distance Indicator, Rear Cross Traffic Alert, and more.